At Blue Forest we are committed environmentalists, and of course, given our affinity for trees, we have a special interest in forest preservation. So when we heard the tale of the woman who lived exclusively in a tree for 738 days just to stop it from being cut down, we knew we had to write about her. Although her treehouse wasn’t exactly a feat of engineering, dedication and commitment to the environment make Julia ‘Butterfly’ Hill this week’s Treehouse Hero. Julia ‘Butterfly’ Hill, born in 1974, spent much of her early life on the move, as her father was a travelling preacher. Her nickname “Butterfly” comes from a hiking trip she took when she was seven years old, during which a butterfly landed on her finger and stayed there for the rest of the hike. She has reportedly had the nickname ever since. Her journey of ecological activism seems to have begun in 1996 when, at age 22, Julia was almost killed in a car crash that left her struggling to speak and walk normally for almost a year. She has said that the accident made her realise that she had been “obsessed by my career, success, and material things”, and she soon took up the cause of preventing the destruction of the redwood forests in Humboldt County, California. The ‘tree sit’ that made Julia famous began in December 1997. In opposition to a campaign of clear-cutting undertaken by Pacific Lumber Co., a number of environmentalists had been occupying various redwoods in Humboldt County for relatively short periods of time. Initially, the call was for someone to stay in a tree for a week, and Julia was the only volunteer. 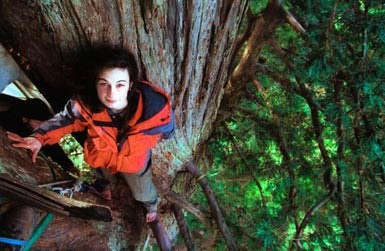 On 10 December 1997, she climbed a 180-foot, 1500 year-old redwood named Luna, and didn’t come down for 738 days. Living on two 6-by-6-foot platforms for the entire duration, Julia was supported by a ground team who brought her food and supplies. During her stay in the tree, Julia experienced growing media attention as news spread of her extended protest, as well as intimidation from opposition. She was able to give radio interviews using a solar-powered mobile phone, and she became known as the “in-tree correspondent” of several cable TV shows. On one occasion, Julia was almost blown out of the tree by a helicopter that had been sent to hover near her perch to intimidate her. But she persevered, and eventually an agreement was reached whereby Pacific Lumber agreed not to harm Luna or any tree within 200 meters, and Julia came back down to Earth. Julia’s marathon tree sitting captured the attentions and imaginations of thousands worldwide. 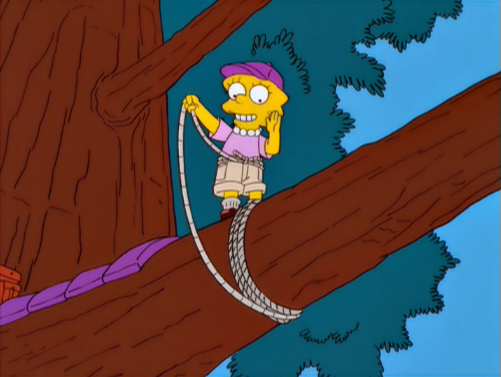 In November 2000, an episode of The Simpsons aired titled “Lisa the Tree Hugger”, which was inspired by Julia’s story. 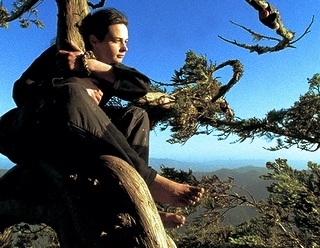 In the episode, Lisa takes Julia’s place at the top of a redwood, hoping to impress an environmentalist activist she is smitten with. Additionally, references to Julia have appeared in songs by a number of artists in the past 15 years, including The Red Hot Chilli Peppers who include the lyric “J. Butterfly is in the treetop” in their hit song “Can’t Stop”, and Neil Young mentions that the title character “still wants to meet Julia Butterfly” in his song “Sun Green”. Today, Julia ‘Butterfly’ Hill is a life coach, public speaker and author. If you have been inspired by Julia’s story, and you’d like a taste of the tree life for yourself with a few more creature comforts, check out Blue Forest’s endorsed treehouse escapes.